A pair of goals in each half gave the No. 12 University of Florida soccer team (12-4-2, 6-1-2 SEC) a 4-0 win over No. 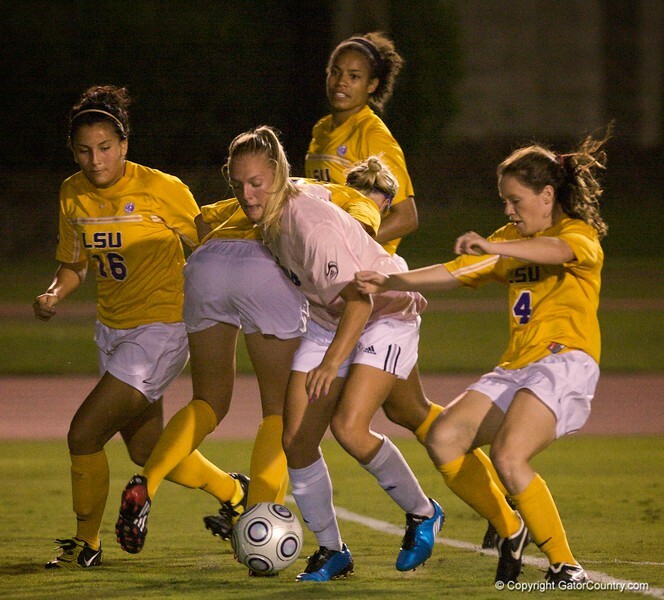 17 LSU (10-4-3, 6-2-1 SEC) Thursday evening in front of a James G. Pressly Stadium crowd of 1,359. The win moves Florida from third to second in the Southeastern Conference standings. The Gators have two matches remaining in their league schedule – at Arkansas on Sunday and versus No. 10 and SEC leader South Carolina on Friday, Oct. 30. In her second consecutive start and first at home, redshirt freshman McKenzie Barney scored Florida’s first and final goals of the match. Freshman Brooke Thigpen scored Florida’s third goal in the 61st minute, moving her into second among the Gators with six goals this season. UF goalkeeper Katie Fraine turned in four saves Thursday, including a diving stop on Taryne Boudreau’s 23-yard free kick in the eighth minute. LSU’s starting goalkeeper, Mo Isom, turned in three saves. Hannah Linzay entered the match in the 83rd minute for the Tigers and did not record a save. The Gators wore pink uniforms Thursday as it was Florida soccer’s first Cancer Awareness match. Events surrounding the match had information regarding prevention and raising awareness about the fight against the cancer. For one of the Gators, the match had special significance. Senior Lauren Hyde’s mother, Lisa, passed away from breast cancer in Hyde’s senior year of high school.